Are These 2 Dividend Aristocrats Stocks to Buy Today? Illinois Tool Works and 3M Company have generated great returns for investors, so do their stock price dips in 2018 present a buying opportunity? It's fair to say the market has fallen out of love with the electrical equipment/multi-industry sector in 2018 and the steep declines in stocks like 3M Company and Illinois Tool Works are emblematic of the market's fears. That said, both stocks are Dividend Aristocrats -- they've increased their dividends for more than 25 consecutive years -- and therefore are income investors' favorites. Is now the time to get greedy when others are fearful of these stocks? Some of both companies' end markets are showing signs of approaching late cycle growth, while automotive -- a key end market for both -- looks like it's already peaked. A slew of industrial companies have reported pressure on margin as a result of rising commodity costs in 2018 -- Illinois Tool Works was forced to cut its full-year operating margin outlook recently from a range of 25% to 25.5% to a new range of 24% to 25% as a consequence of "price/cost related margin dilution." As you can see in the chart below, the valuation of both stocks looked high at the start of the year compared to the previous decade, and given the fear of a cyclical slowdown, investors have probably been exercising some caution. 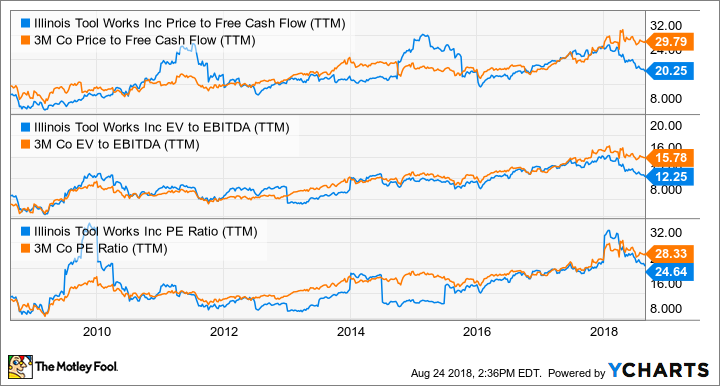 Dealing with these points, despite the stock price falling on a free cash flow (FCF) valuation basis, 3M still does not look like a good value. On the other hand, Illinois Tool Works is well worth considering. Data source: Company presentations. *Based on management's guidance for EPS of $7.50-$7.70 and FCF conversion of at least 100%. 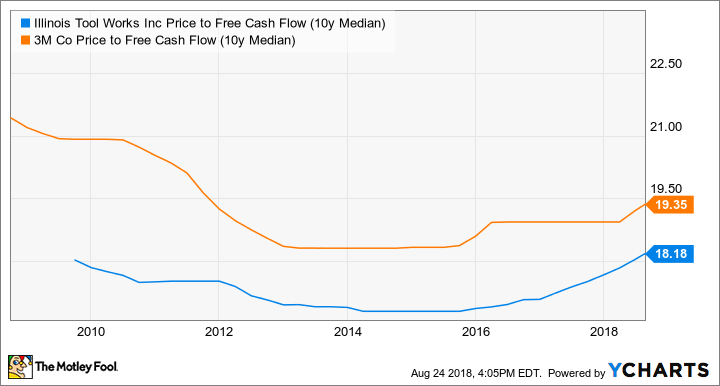 As you can see below, on a forward price to FCF basis 3M Company doesn't look a good value compared to recent years, however, Illinois Tool Works is starting to look attractive. The issue of rising input costs -- most notably from raw materials like steel and copper -- has been a theme of the industrial sector in 2018. However, history suggests that commodity costs tend to be cyclical, so their impact may not be lasting. Commodity prices tend to rise with an increase in demand. In turn, higher prices induce more production, which then leads to a correction in price, usually leading to a pick up in demand and then the cycle begins again. In the usual scenario, raw material price improvements will moderate in the future and the current increases, which are causing margin headwinds right now, won't be an issue in a year or two. Moreover, both companies are trying to increase pricing in order to combat rising costs, and if they stick and costs fall, then both companies could see good margin expansion. Comparing the two companies discussed here, I think Illinois Tool Works is better positioned, not least because it's managing to increase margin through its so-called enterprise initiatives. In a nutshell, the company's enterprise initiatives are self-help actions taken to improve productivity and profitability, such as cutting back on less profitable product lines, focusing on its key customer's requirements, and strategic sourcing. As you can see below, despite pressure on "price/cost" Illinois Tool Works continues to expand margin, even as management was forced to reduce full-year margin guidance as outlined above. For Illinois Tool Works, if and when commodity pricing pressure eases, the company has an opportunity to significantly increase margin. Data source: Illinois Tool Works presentations. Bp is basis points where 100bp equals 1%. Chart by author. Turning to 3M, one concern with the company relates its disappointing pricing performance in recent quarters. As you can see below, for the last year or so its organic growth has been driven by volume increases rather than pricing improvement. This is a worry because creating differentiated products that have intrinsic pricing power is a key part of its business model and a reason why the company traditionally commands a premium valuation. Data source: 3M Company presentations.Chart by author. Some short-term investors don't like holding a stock that has a growth rate that is likely to slow in the next year or two -- both stocks are forecast to have double-digit growth in 2018 slowing to high single digits in 2019. However, investors with a long-term perspective will note that there's a difference between a slowing growth rate and an absolute decline. If Illinois Tool Works can hit its earnings and FCF guidance, then I think the stock looks a good value right now. However, on a risk/reward basis, 3M's valuation still looks a little demanding.